The holidays, never short on food! Also plenty of leftovers to take home. Had some left over paper from Life.Love.Paper and used a date stamp to a mail label. Added a “Cheers” card from Jamaica Makes, at first I really didn’t want to use it. Just too pretty. But I shouldn’t hoard the cards. Have been loading up on sparkling cider! Normally, I’ll try to keep the decorations out until the beginning of the new year. But this year felt like cleaning up a little earlier. Didn’t have much going on so had filled the page protector with Life.Love.Paper journaling card. On the last day, I added glitter gold letters and numbers to an open envelope. Gathered all the holiday cards that we received this year and punched holes. Tied them all up with a ribbon and added them to the end of the album. December Daily 2015 officially done! Until next year! Used one of the printables from Life.Love.Paper and added circle stickers that I previously had. Then added a date stamp. Took a picture of Bear one day while he was laying on the couch and added stickers I previously had. For the two 2×3 page protector, on the left side added a card I bought from Life.Love.Paper. On the other side, cut down a tag and added stamp from Kelly Purkey. On the back of the tag, I added a sticker from ikea and a picture of the Christmas tree from my parents. I need to work on my stamping! Can never get the right constancy, either pressing down too hard or too light. Added a photo of the siblings in plaid this year. Oh the pups! It was their birthday on the 26th, got to get a picture of both of them! Printed a 4×6 photo of the holiday stovetop potpourri and added the puffy sticker from Target. Punched the holiday card envelope and tied it with some twine. As a final touch added wax seal, please excuse the accidental wax on the side. On the other side, I glued this year’s holiday card to the envelope and added gold glitter stickers. Put the label maker to use and typed out Fifteen. Went with black and white photo of the mini Christmas Tree and added a free printable label. On the other side, I used one of the Project Life journaling cards and added a label sticker with a date stamp. Printed a photo of the of Michael Buble’s Christmas Album and added washi tape on the side and punched holes to put into the album. Home Alone! The classic Christmas movie, they sure don’t make movies like that anymore. Love this page, a friend and I went to Lucketts and printed some photos from our trip. The plaid card I cut out from a Target Magazine. Made some stovetop potpourri, oh the smell of the holidays! I added some Studio Calico Seven Paper puff stickers. During the holidays, love seeing the different holiday theme in the catalogs from different stores. I specifically love the ones from J.Crew, they have pages for gift guides. Makes me want to purchase quite a few things. Good job on marketing J.Crew. There were some stickers from Boden and kept those to add it to the page. The number “7” was actually a “Z” in a pile of collection of letters I had. I added a “4×4″ page protector from another album I had. Added in some old scrapbook transparency, gold number 8 and a Christmas gift tag from last year. Had some old tissue paper that I cut to 3×4. Ironically, it says “let it snow” when all we have been having was pretty warm weather! Had a roll of star shaped ribbon from last year that I individually cut up the stars and glued them to the page protector. Made good used of one of the rolls of wrapping paper and cut it down to 4×6. Added a tag and date stamp for the last day of week 2. Sooooo, I am WAY late in posting December Daily this year. Had been filling in the album but hadn’t gotten a chance to take photos of the photos. Slowly getting there. 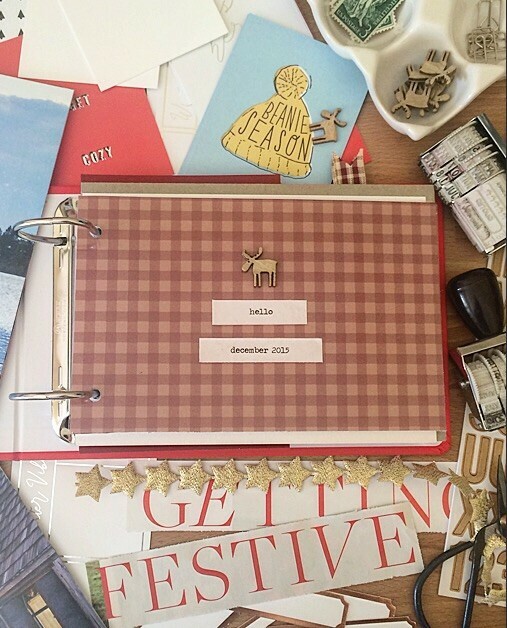 Today I am sharing how I prepped the album. What was challenging this time around was that I was working on finishing/catching up on Project Life and working on this album at the same time. I purchased a smaller album this time around. Last year I had a 6×8 album, I think that was too big for the first time around for December Daily for me personally. Struggled in trying to fill it. This year I went with Jasmine Jones 4×6 Album. Hoping to have better luck this year in filling it easily. Had a few leftover scrapbooking holiday paper from last year. Still want to keep with the rustic feel but add a few fun modern pieces! In addition, Studio Calico had some pretty amazing printables this year! I printed a few journaling cards out to add to the stash. Similar to last year, started a list with the days in December and put down what I wanted to capture on that day. I intend to capture moments all the way to December 31. Some stop right on December 25, I thought, why not capture the entire month of December. Bringing back out the post-its, it’s a good constant reminder when I use them to jot down ideas on the page protectors. You can find all the photos to December 2014 album below!